Lifespan: Three to four years. Mature Size: 1' high and 3-5' wide. 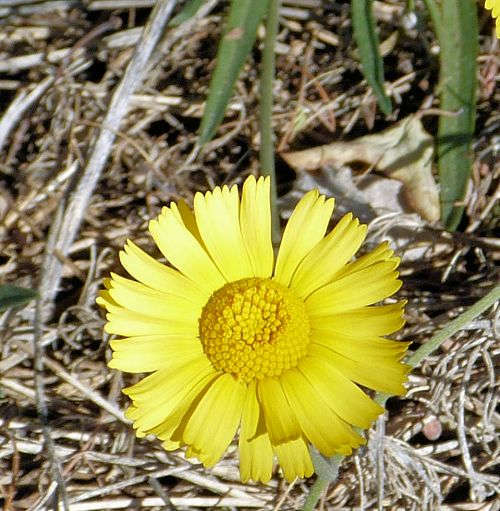 Flowers: Daisy-like, at the terminal end of a stem, with yellow rays having squared tips with two notches, and a yellow to orange center, fragrant. Bloom: Sporadically, all year in regions without freezes. Fruit: Hairy seed within dried the flower head. Leaves: Green, linear, surrounding the base of the plant, with an unpleasant odor when crushed. Stems: No thorns. Unbranched, leafless flower stems. Roots: A taproot makes transplanting difficult. Wildlife: Attracts insects, sometimes butterflies. Rabbit and deer resistant. Origin: Alberta, Saskatchewan, western United States minus Washington and Oregon, into Mexico. USDA hardiness zones: 5b-11. This plant dies to the ground in hard freezes. Heat tolerant: Yes, but it has difficulty in temperatures over 105°F. Sun: Full sun, but part shade, especially afternoon shade, is needed in high temperatures. Water after becoming established: Monthly. It withstands frequent watering in very well drained soil but root rot can occur if the soil stays moist. Soil: Well drained, dry, low in organic content, pH 6.1-7.8 (slightly acidic to slightly alkaline). Mulch: Not necessary and may be detrimental when the soil is subjected to frequent watering. Gravel is better than organic mulch. Prune: Remove spent flower heads to improve appearance. Propagation: Seed. This plant may self-seed. 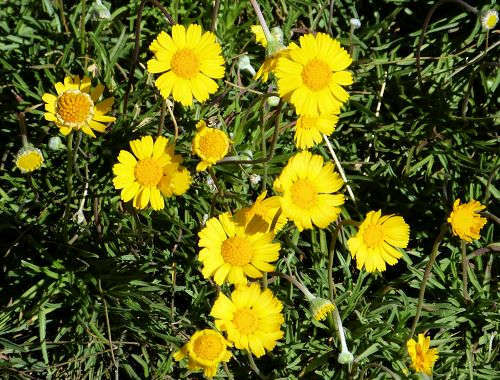 This plant is a member of the Aster family (Compositae). The plant genus, Tetraneuris, is sometimes referred to as Bitterweed. Another common name for this plant is Perky Sue. 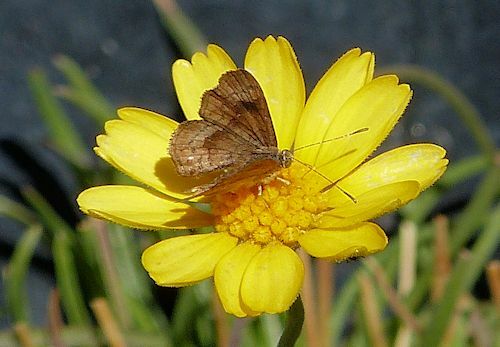 The butterfly is a Fatal Metalmark.